Home | Thanks for Signing Up for Zoodle Book Updates! Thanks for Signing Up for Zoodle Book Updates! Now you are almost set to get first dibs at the book! I just shot you an email asking you to confirm your subscription to my email list (which is how I’ll send you notifications). Hit confirm and you’re good to go! (If you don’t see the email check your spam folder). Then, and ONLY then, will you be set to get first notice when Oodles of Zoodles is published. And, yes, I will be offering a special price for folks who have signed up for updates! To thank you for signing up, I’d like to offer you a sneek preview recipe from the book! 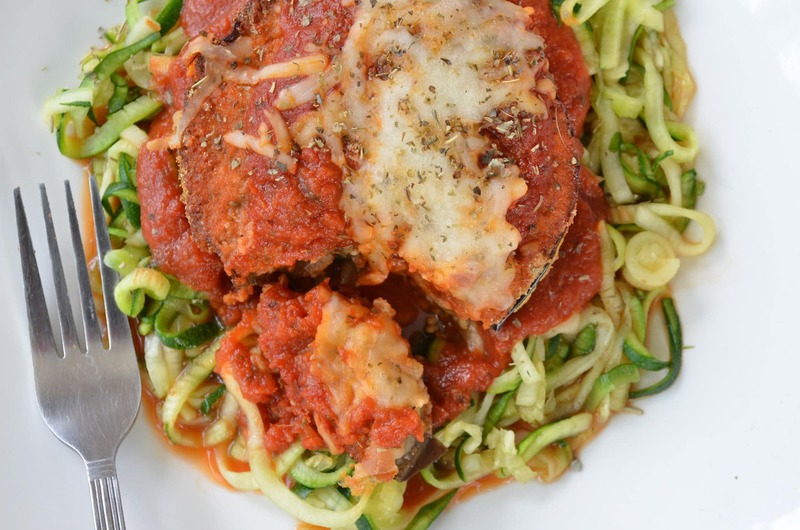 This is my Baked Eggplant Parmesan with Zoodles and it is YUMMY! Now I like to eat this as-is, but if you are looking to amp up the protein, this same method works very well with a chicken cutlet (and the recipe for that will be in the book). More soon, but until then…let’s get to the good stuff. Set up a dredging station with the egg whites in a bowl and a mixture of bread crumbs, Parmesan cheese, salt and pepper whisked together on a plate. One at a time, dredge eggplant slices first in egg whites, then in the bread crumb mixture, then repeat. When finished, arrange on a rack placed inside a cookie sheet. Bake 25 to -30 minutes or until fork tender and coating is crispy. Prepare the sauce by sauteeingsautéing onions and peppers in a skillet sprayed with nonstick cooking spray, 2-3 two to three minutes or until softened. Add marinara sauce, cover and simmer about 20 minutes. Plate the dish by placing zoodles on a plate. Top with a piece of the baked eggplant, about 1/3 cup (or more) of the sauce mixture and top while hot with shredded mozzarella cheese.